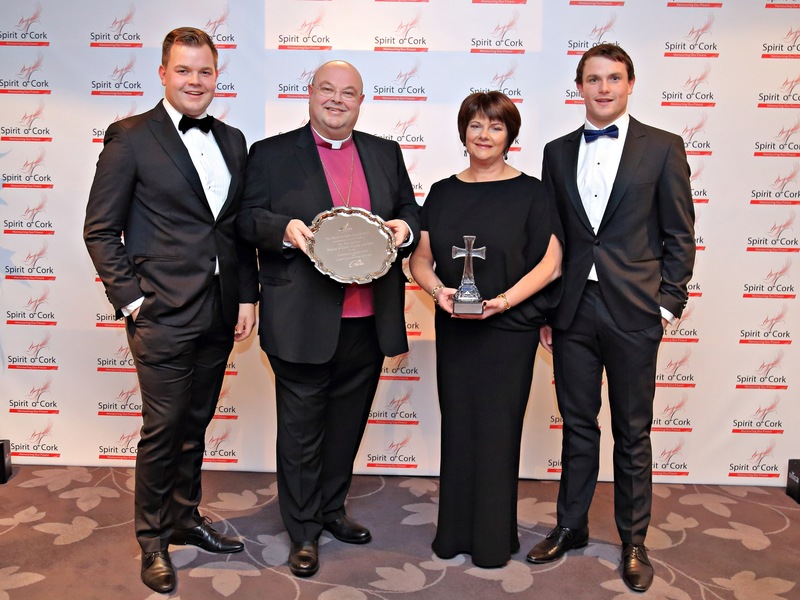 At a dinner hosted by the Cork Civic Trust in the Clayton Hotel in Cork City, the Spirit of Cork Award 2017 was presented to the Right Reverend Dr Paul Colton, Bishop of Cork, Cloyne and Ross. This is only the third time that this award has been presented. 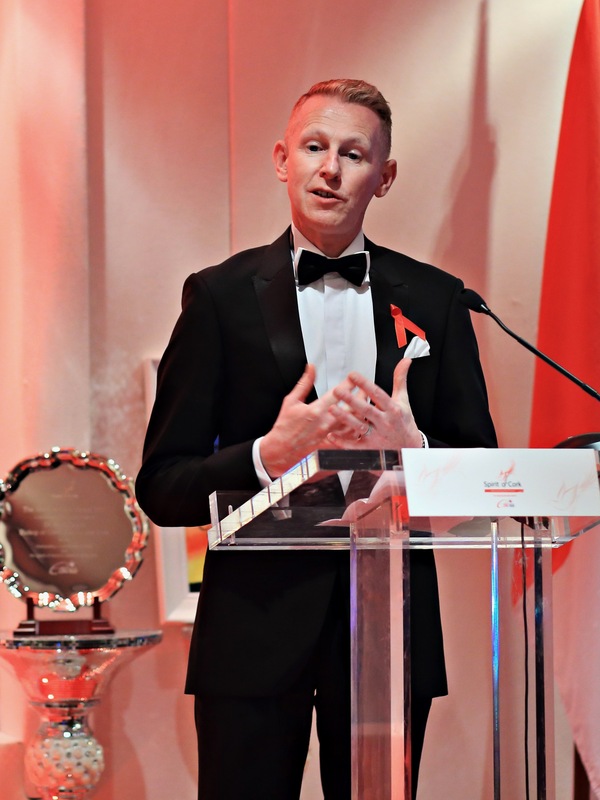 The inaugural recipient was Dr Edward Kiely of Great Ormond Street Children’s Hospital ,and in 2015 the late Cork man and leading sports broadcaster and businessman, Bill O’ Herlihy, was the recipient. 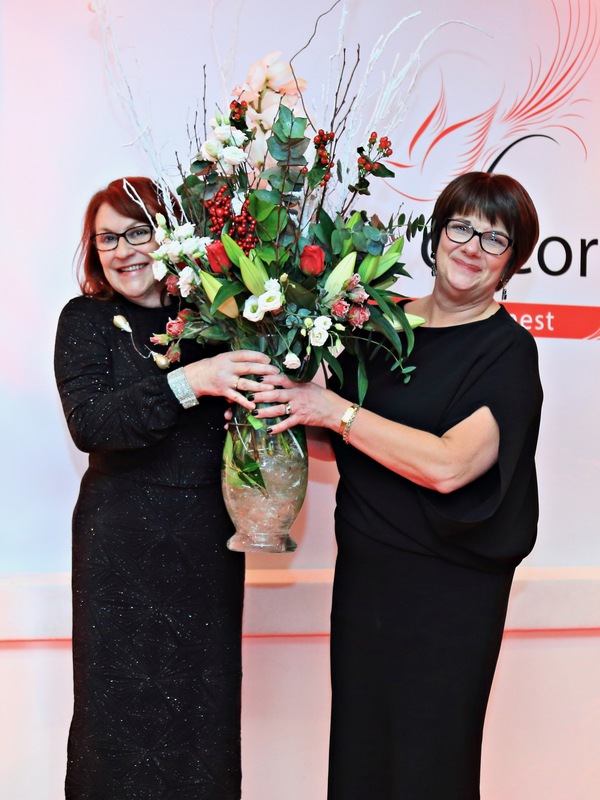 Through Spirit of Cork, our city and county has the opportunity to honour and recognise people who have made a real difference to Cork and her people. 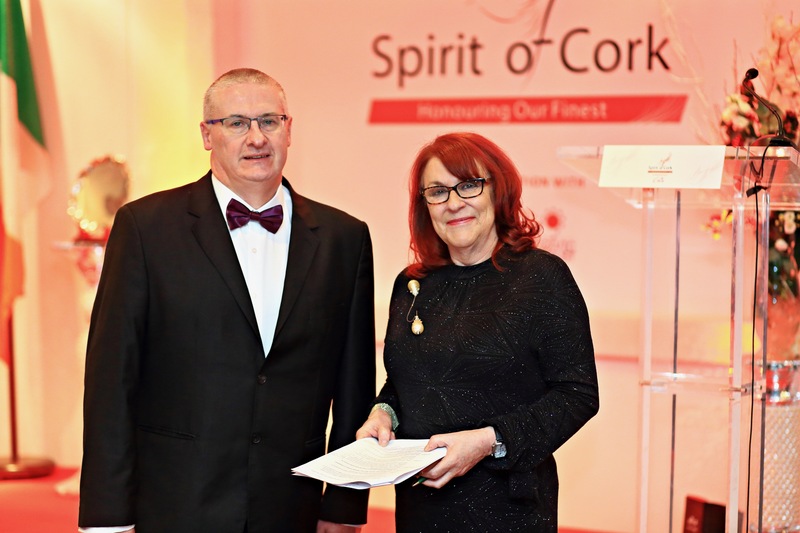 Spirit of Cork is an honour and recognition for people that we are proud to be part of our Cork family. Be they in Cork or in any part of the world where Cork is recognised, we wish to acknowledge them and their exceptional contribution to Cork. 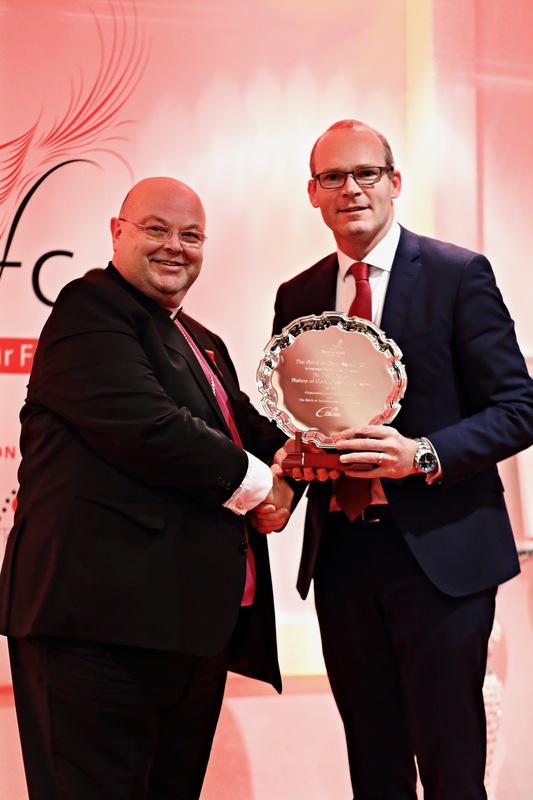 The presentation of the award was made by An Tánaiste and Minister for Foreign Affairs and Trade, Simon Coveney TD, who spoke about Bishop Colton’s contribution to the life of Cork. Greetings and messages of appreciation were read from the Michael D. Higgins, President of Ireland, An Taoiseach Leo Varadkar, T.D., and from David and Victoria Beckham at whose wedding the Bishop officiated in 1999. Earlier, the Lord Mayor of Cork, Cllr Tony Fitzgerald, the Deputy Mayor of Cork County, Cllr Susan McCarthy, and Bishop John Buckley, Bishop of Cork and Ross, paid their tributes. The awards ceremony was presided over by PJ Coogan (96FM) and Bibi Baskin. 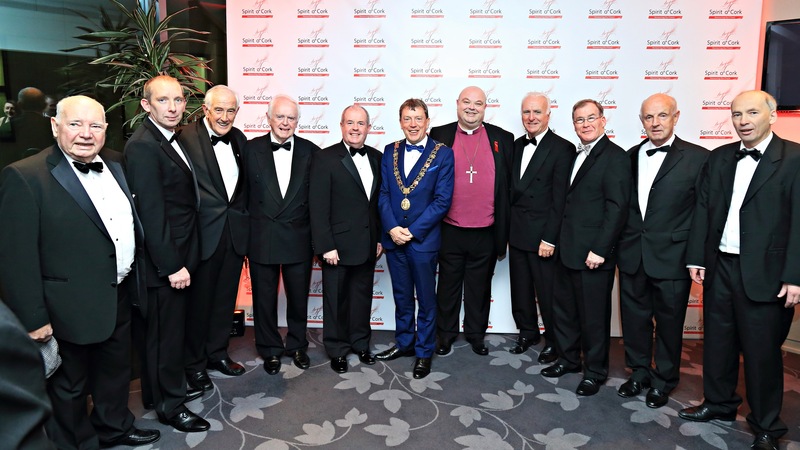 The Colton family, Bishop Paul, Susan, Andrew and Adam, were joined by family, friends and colleagues as well as members of the Church of Ireland community and many members, past and present of the Cork Civic Trust. Grace before dinner was said by the Bishop’s Chaplain, the Reverend Elaine Murray. 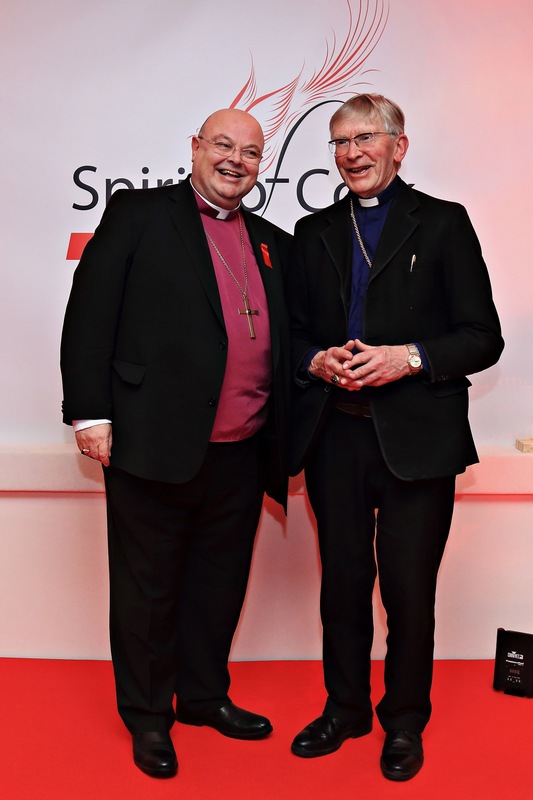 Archdeacon Adrian Wilkinson spoke on behalf of the clergy and people of the Diocese. A second presentation was made by the Lord Mayor on behalf of the citizens of Cork later in the evening, and further tributes were paid by Senator Jerry Buttimer, Michael McGrath, T.D., former Senator John Minihan, Robin O’Sullivan, Finbarr of Shea, David O’Brien (CEO of St Luke’s Charity, Cork), and John X. Miller, CEO of Cork Civic Trust. Bishop Paul and Mrs Susan Colton, and every guest present were presented with a print of an original painting called ‘Spirit of Inclusiveness’ by 14 year old Malika Benhaffaf, sister of 8 year olds Hassan and Hussein. Mrs Susan Colton was presented with flowers and with a gift on behalf of everyone present, by Bibi Baskin. Among the distinguished guests present were: Senator Jerry Buttimer (Leader of Seanad Eireann), Senator Colm Burke, Deputy Michael McGrath TD and Sarah McGrath, Elected Members of Cork City Council, elected Members of Cork County Council, Prof. Patrick O’ Shea (President of University College Cork), Bill O’ Connell (The President of Cork Chamber of Commerce) and Aileen O’ Connell, William Cuddy (President of Little Island Business Association) and Valerie Cuddy, Dr Chris Coughlan(Adjunct Professor of Management at NUIG) and Joan Coughlan, Commodore Hugh Tully (Flag Officer Commanding the Naval Service) and Margaret Tully, Lt. Col Michael O’ Connor (The Defence Forces) and Claire O’ Connor, Chief Supt Barry McPolin (An Garda Siochana) and Crena McPolin, Bill Holohan (Chairman of The Chartered Institute of Arbitrators in Ireland), Dominic Daly (Honorary Consul of Belgium), Sir Freddie Pedersen (Honorary Consul of Denmark), John X Miller (Honorary Consul of Hungary), Michael Barry (Honorary Consul of Mexico), Frances Lynch (Honorary Consul Emeritus of Brazil), Michael Mulcahy (Honorary Consul Emeritus of Poland) Former Government Minister Kathleen Lynch, former TD Noel O’Flynn, David O’ Brien ( Chief Executive of St Luke’s Charity, Cork), and Trevor Dunne (President of the Incorporated Church of Ireland Cork Young Men’s Association, Garryduff Sports Centre). In addition to the current Lord Mayor and Lady Mayoress, also present were former LordsMayor and Lady Mayoresses who served in office over the past nearly 19 years that Bishop Colton has been Bishop of Cork, Cloyne and Ross: Cllr Tom O’ Driscoll, Cllr John Buttimer, Cllr Terry Shannon and Ursula Shannon, Cllr Chris O’ Leary and Angela O’ Leary, Mr Jim Corr, Senator Colm Burke, Mr and Mrs Joe O’ Callaghan, Mr Brian Bermingham and Elma Bermingham, Mr Michael Ahern and Eileen Ahern, Mr Donal Counihan and Breda Counihan, and Mr Tim Falvey and Abina Falvey. A musical tribute after the meal was performed by Ireland’s Bella Voce Amanda Neri. Music during the drinks reception beforehand was performed by Tr3ble Clef, and during the meal guests were entertained by Bob Seward and the Clubmen. Throughout the evening photographs were taken by award-winning photographer Erich Stack. … that Michael Mulcahy will attest to the fact that I was a reluctant recipient, and had to be persuaded. … I can think of 1000s of others who fit the bill of The Spirit of Cork; some of you are sitting here, most are not – people who have done this city and county great service, publicly and privately, some who have carried the weight and innovation of charitable and voluntary response to the pressing needs of our time, and some who, in their own lives, have been exemplars of human fortitude and self-sacrifice. I grew up with a version of Christianity that, by and large, looked in on itself, or rather, when it looked out, it sought the company of people like ourselves, or who were prepared to become like us, to think like us, to marry us and to perpetuate our way. We were taught to lie low and to get on with it in our own minority way. There were reasons for that, not all of them without foundation. Protestants were not alone either in their insularity. When it came to religion, the Cork I grew up in was more fort than frontier. Everything outside was risky. I soon discovered, and still believe, that life is more exciting when you take down walls rather than build them. Instead of pulling up bridges over moats to leave them down and to go out and start coming and going. Our children, rightly, have no truck with now with the world of circled wagons, nor do the majority of people. Besides, there are more than two versions of Christianity in the village now, and there are many other faiths, philosophies and outlooks. We live in a world where there’s room, enough room. That brings its own challenges and opportunities; learning about one another, and building discourses of mutual understanding and common purpose. I’ve a lot of contact with people who don’t really like the Church or institutional religion, but I’ve found that many are quite religious, and very keen on the message and person of Jesus Christ. There we’ve found common ground and made common cause. Many of them have heard of the Jesus who, in the Gospel, turned water into wine, but have been wounded by a church that turned their good wine back into water. I am keen to show, and to encourage others to show, how broad and wide and inclusive the love of God is. I’ve never been interested in the sort of Christianity that, as I say, builds battlements, pulls up drawbridges, or circles wagons. There’s room for doubt and uncertainty. There’s room for questions. The wounds and injuries of history run deep; it falls to us to heal and reconcile. The love of God embraces and includes; it does not push people away. And that is why I will keep doing what I do, and saying the things I say, even when, or perhaps especially because, it leads us into vigorous dialogue with one another. 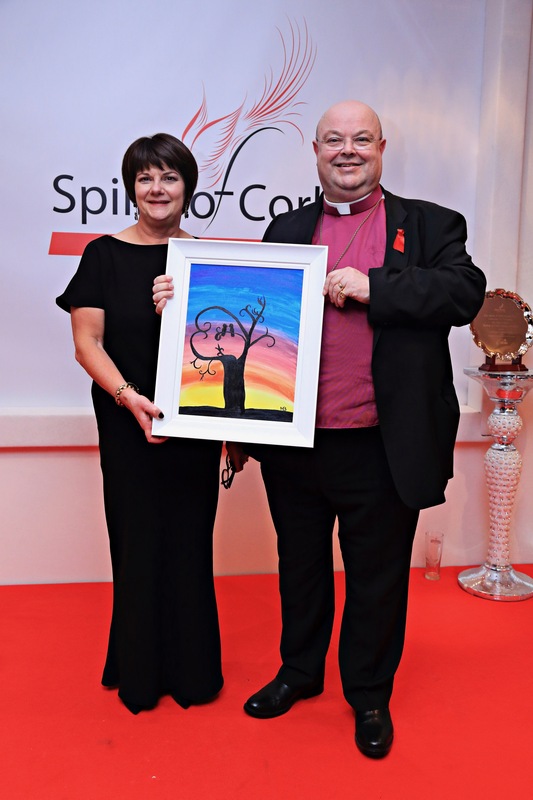 This entry was posted in Bishop, Church in Society, Cork, Diocese, Spirit of Cork Award. Bookmark the permalink.